The deals the Yankees made before the 2016 trade deadline were remarkable. 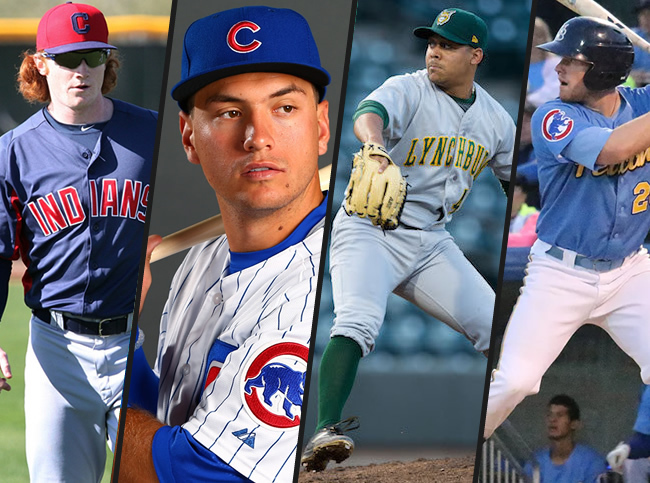 Over the course of one week, the team landed multiple former first round picks–three of whom are top 100 prospects–and completely restocked their farm system, which is now one of the best in baseball. But that’s not what made these deals remarkable. Indeed, what made the trades of Aroldis Chapman, Andrew Miller, Carlos Beltran, and–to a much lesser extent–Ivan Nova remarkable is the complete change of philosophy they represent. What is often forgotten in this current baseball climate–in large part because many so-called “fans” are frontrunners who don’t know their history–is that for almost all of the 1980s and the early part of the 1990s, the Yankees were not the powerhouse modern baseball fans see them as today. Under the directive of owner George Steinbrenner, the team spent much of the 1980s trading away promising young talent for aging veterans while endlessly trying to buy success in free agency. 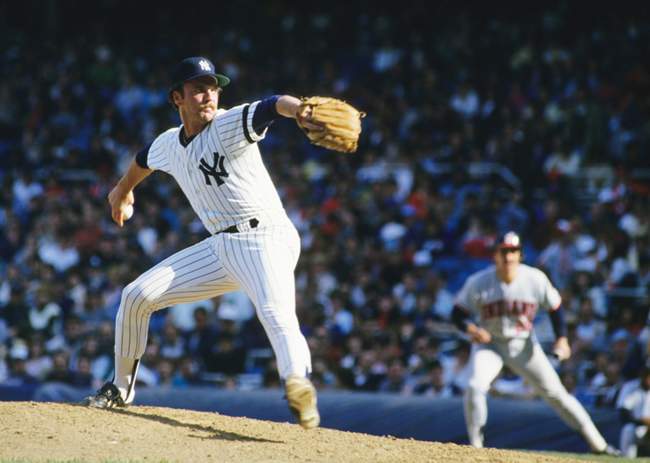 Prospects like Bob Tewksbury, Jose Rijo and Doug Drabek–the latter of whom actually won a Cy-Young Award in Pittsburgh–all went on to All-Star level careers with other teams because the Yankees weren’t patient enough to see their development through. Eddie Lee Whitson (pictured), who had already been on three teams and was coming off a career year in 1984, received a big paycheck to join the Bronx Bombers in 1985. Unfortunately, he pitched so poorly and ended up so hated that the team had to stop using him during home games due to excessive booing and harassment from fans. Whitson’s wife even had to stop coming to games out of fear the fans would abuse her too. He was eventually moved to the bullpen, but that ultimately proved to be a disaster as well. And you thought Carl Pavano had it rough. From 1982-1989, the Yankees made the playoffs a grand total of zero times and the J. Wellington Wimpy philosophy of “I’ll gladly pay you Tuesday for a hamburger today,” brought the Yankees to rock bottom in 1990, when they lost 95 games and finished in 7th place. That same year, however, ended up being the turning point for the franchise because of something completely unrelated to anything happening on the field. In the summer of 1990, Yankees owner George Steinbrenner was banned from baseball for life by commissioner Fay Vincent for his involvement in a nefarious scheme targeting one of the team’s outfielders, Dave Winfield. The saga is long, but the short version is that Steinbrenner contractually owed Winfield’s foundation a six-figure sum that he did not want to pay. 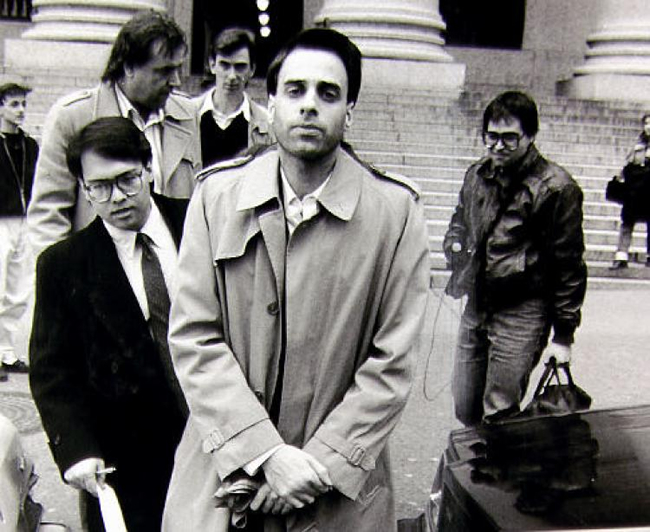 Howie Spira (pictured), who had worked as an unpaid publicist for Winfield’s foundation for years, was desperate for cash because he was a compulsive gambler who owed a lot of money to some very bad people. So, he approached Steinbrenner and offered him dirt on Winfield’s foundation for a price. Seeing this as an opportunity to discredit the foundation and get out of paying the money he owed, Steinbrenner took the bait. The Yankees’ owner paid Spira $40,000, but when he decided that wasn’t enough and came back for more, Steinbrenner pulled the plug and had him arrested–and eventually sent to prison–for extortion. Steinbrenner’s “lifetime ban” ended up being a little over two years–which I suppose could be a lifetime if you are hamster or a child in war-torn country–but it sewed the seeds for the Yankees dynasty to come. During the “ban,” Robert Nederlander, a limited partner in the team, was given the reigns. However, unlike Steinbrenner, he realized he wasn’t the best person to make baseball related decisions, choosing instead to leave that to his personnel and scouting departments. This philosophy continued in 1992 when Nederlander resigned and Steinbrenner’s son-in law, Joe Molloy, took over. 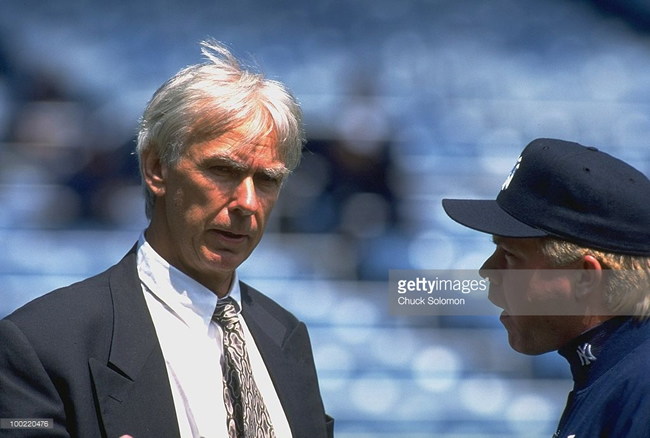 The change in culture from a micro-managing owner who wouldn’t stay out of things to a team that entrusted its baseball people to make decisions, allowed General Manager Gene “Stick” Michael (pictured with Buck Showalter) to do what needed to be done: rebuild the farm system, allow young talent to develop and stop wasting money and assets on aging veterans past their prime. When Steinbrenner returned in 1993, the roadway to the next decade of great Yankees teams had already been paved. Michael used his freedom running the baseball operations to prove once and for all what a genius he was, signing or drafting Mariano Rivera, Andy Pettitte, Jorge Posada, and Derek Jeter. Jeter, in particular, was a major coup for the Bronx Bombers. The consensus best player in his draft class, Jeter–a high school prospect out of Kalamazoo, MI–made it known he would go to college unless he was given a signing bonus nearing $1 million, which scared off many teams. As a result, he was unexpectedly available when the Yankees picked at #6, and it was the belief Michael and his scouts had in the future all-time great that convinced Molloy to pay Jeter’s asking price. Michael also recognized that Bernie Williams was the team’s future in centerfield, and saw the need for a left-handed bat to hit 81 games-per-year at Yankee Stadium. With those two things in mind, he stunningly dealt rising star centerfielder Roberto Kelly to the Cincinnati Reds for Paul O’Neill–a solid lefty outfielder who had a rap for being unable to hit left-handed pitching–in a move that was widely criticized at the time. Despite Michael having to defy Steinbrenner’s orders to trade him early on, Williams turned out to be one of the game’s best players, and O’Neill overcame his perceived inability to hit lefties en route to a Yankees career which saw him appear in multiple All-Star games and win four championships. Despite the popular legend of George Steinbrenner as the win-at-all-costs owner who never took no for an answer, it was the brilliant planning and execution of Gene Michael–not the meddling and spending of George Steinbrenner–that brought the Yankees back to glory. Michael knew what all great general managers do: patience is a virtue. Wildly spending on big names may look good on paper, but it is nothing more than a recipe for mediocrity. Just ask Washington Redskins owner Daniel Snyder. If you want to build a consistent winner, you use your resources on scouting, player development, and the re-signing of your own emerging stars. There’s nothing wrong with signing a major free agent or making a big trade from time to time, but only as a supplement to what you have already built, not in place of it. This was the blueprint for success Cashman was following when he traded away Beltran, Chapman, Miller and Nova around the deadline. Considering the fact that Gene Michael is his mentor and still one of his most trusted confidants–who once again showed his tremendous baseball acumen by pushing the franchise to trade for an unheralded Didi Gregorius two years ago when virtually nobody else believed in him–this is not surprising at all. The Yankees are in a similar place to where they were in the down years before Michael took over. The team is about to miss the playoffs for the third time in four years–the likely result even if they had kept their veterans–and the culprit has been a lack of player development and over-reliance on highly paid, aging veterans, which is exactly what sent the Yankees into the abyss that Michael pulled them out of in the 1990s. Cashman realized that with a team of aging players and a mediocre farm system, now was his time to strike. The Yankees were hovering around .500 and doomed to several more years of mediocrity if he didn’t. No doubt he got a little lucky here, as well, since the desperation of so many contenders for top flight relievers meant Cashman–who had two of the top five relief pitchers in the sport in Miller and Chapman–was sitting on a goldmine. He was dealt a winning hand, though that can still be easy to screw up if you aren’t careful. But Cashman didn’t screw it up. Instead, he played it like a grand master, reeling in a huge haul of highly regarded prospects (some pictured above) that left executives from other teams astonished. 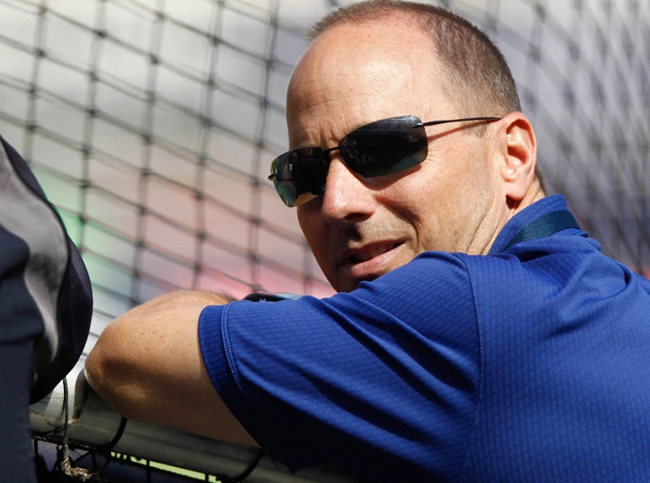 In the course of one week, Brian Cashman transformed the Yankees’ future from old and boring to young and exciting–something almost unheard of in pro sports. No doubt Gene Michael is somewhere smiling right now, reminiscing about old times and beaming with pride at the outstanding job his protege has done. And for as much credit as Cashman is getting–deservedly so–an unsung hero in all of this is the team’s managing partner, Hal Steinbrenner. Knowing his father’s history, no matter how unlikely the chances of a playoff berth, there is no way George would have allowed Cashman to trade away the team’s three best players when they were still within a reasonable distance of a wild card spot. Unlike his father, Hal was willing to listen to reason, see the big picture and let his top baseball man do his job. There is no guarantee that the Yankees will be great again over the next decade. It is possible none of the prospects they got will pan out. But history shows that all of the young talent they just acquired greatly increases the odds of a prolonged contender being built. Much like NFL teams who hoard draft picks, the deeper the farm system, the greater the chance of unearthing the next Jeter, Williams, Posada, Rivera, or Pettitte. And if somebody like Chris Sale–a rare superstar in his prime with a team-friendly contract–becomes available, they now have a much larger pile of attractive assets to offer. Anything can happen, and the results–as they did when Michael took over 26 years ago–may take a few years to take shape. But one thing is for sure: with the cupboard full, an owner who spends and doesn’t meddle, and a shrewd general manager using a formula that has a strong track record of success, the future looks incredibly bright.